Just as humans will travel to their favorite restaurant, chimpanzees will travel a farther distance for preferred food sources in non-wild habitats, according to a new study from scientists at Chicago's Lincoln Park Zoo that publishes on March 17 in the journal PeerJ. Chimpanzees at Lincoln Park Zoo prefer grapes over carrots. Previous research at the zoo provided that insight into food preferences. Now, a 15-month study, led by Lydia Hopper, PhD of the Lester Fisher Center for the Study and Conservation of Apes at Lincoln Park Zoo, suggests that the apes are willing to travel further to get the goodies they prefer. This is the first study of its kind in a zoo setting, and the results compare nicely to similar research on wild chimpanzees. 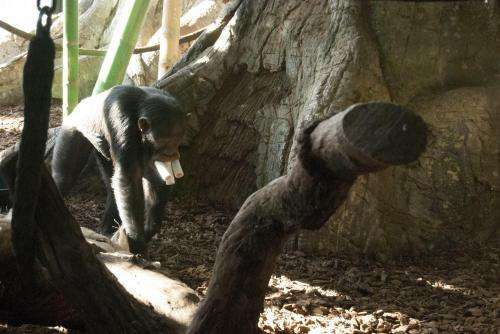 In order to receive a food reward, the chimpanzees had to collect tokens, or small lengths of PVC pipe, from a single location. The chimpanzees could then exchange the tokens with researchers at one of two locations - a close location with a carrot reward or a far location(s) with a grape reward. By the third phase (30 sessions per phase), as a group, the chimpanzees preferred to travel further in order to get the better food item (grapes). "It was quite fascinating to see the developments between each of the three phases of the token exchange study," said Hopper. "In addition to learning about food preferences and proximity, we also observed innovative, problem-solving behavior among the chimpanzees." Interestingly, the first chimpanzee to discover the better reward being offered at the far location was a female named Chuckie, who is the lowest-status female in the group. The far location may have been preferred for not only it's food reward, but because it gave her an opportunity to avoid competition from higher-status chimpanzees at the close location. Additionally, alpha male chimpanzee, Hank, observed the other apes and learned the benefits of the far location, thus exchanging 100 percent of his tokens at the far, preferred food location. "All of the chimpanzees in this study demonstrated flexible foraging strategies with minimal scrounging from one another," said Hopper. "Understanding the animals' preferences and exploration of their habitat is critical to caring for these animals."